Manchester United manager Louis van Gaal admitted after the 1-1 draw at Sunderland that a return of a single point from his first two Premier League matches in charge is not acceptable. 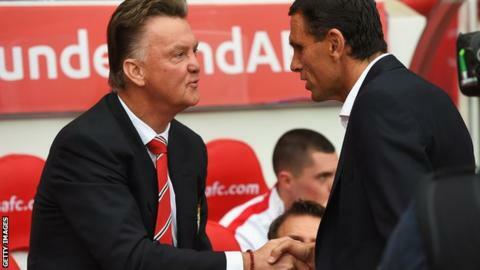 Van Gaal's opening league game ended in a 2-1 home defeat by Swansea. "We have one point and that is not good enough for Manchester United," said the former Netherlands boss. "We have to work a lot. The players are very disappointed after the game because we thought we would win." When asked how long it would take to turn the club's fortunes around, he said: "You can never say how long it takes because when you win the next match, the confidence comes back." Juan Mata fired the visitors into a 17th-minute lead at a time when Sunderland were threatening on a sustained basis. However, defensive frailty proved United's undoing, with Jack Rodwell heading the home side level on the half-hour from a Sebastian Larsson corner. United dominated the latter stages, but could not find a winner, although Van Gaal insisted they might have been awarded a penalty after Robin van Persie and then Ashley Young went down in the box, the latter earning a yellow card. Asked about Young's booking, the third of the winger's career for diving, the Dutchman said: "I have said that he has been touched by the opponent in the 16m area and when it is like that there are referees who are whistling because you cannot touch players in that area because it is a risk." BBC Sport's Pat Nevin has backed Van Gaal to succeed at United but questioned whether they would challenge this season. "I expect Manchester United will improve," he said. "Whether that can be done in time to get in touch with the top teams, that's the big question. "Manchester United must show people they are a team to be feared again. For large parts of last season, teams treated a fixture against them as just another game."